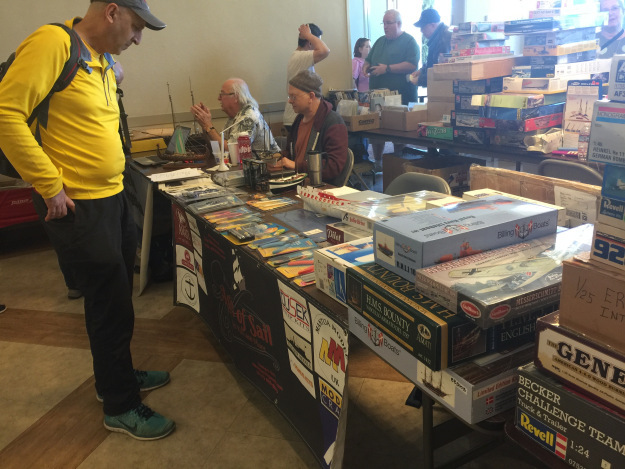 The ship model gathering in Vallejo is back. Vallejo is about an hour north of our shop. This group did a group build of Amati’s Swedish Gunboat, buying their kits from our shop a few years ago during our grand opening event. They haven’t met for a while, so it’s good to see them back together again. It was definitely a long day for me, but I sold a lot of tools, a couple kits, and got to talk with a lot of existing and potential customers. The ship was built as one of the Cherokee-class of 10-gun brig sloops, and was launched in the Thames River on May 11, 1820, at the Wollwich shipyards. In July of that same year, as part of the celebrations for the coronation of King George IV, it was the first man-of-war to sail under the new London Bridge. In 1825, her armament was reduced and a mizzen mast was added, changing her to a barque rig, at which time she was fitted out for service as a survey ship. OcCre’s is a 1/60-scale kit is based on the ship’s 1825 specifications, and features laser-cut parts for the framework, and double plank-on-bulkhead hull construction for ease of build. High quality wood strips are provided for hull and deck planking, wooden dowels for masts and yards, and a full set of fittings in wood, brass, and cast metal, as well as a sheet of photo-etched brass detail parts. The kit also includes colorful flags, rigging cord, display cradle, and a full set of pre-sewn sails. A pictoral instruction book and plans sheets make for an easy to understand build. What’s more, if you want a little extra guidance on building this kit, OcCre has prepared a series of 30 short Youtube videos, each between 30 seconds to 2-1/2 minutes long, illustrating the steps of the build. OcCre’s wooden model kit of the arctic exploration ship HMS Terror is back in stock at Ages of Sail! The bad news is that the manufacturer increased the price of the kit, so our full retail price is now $209. However, the good news is that this is still an incredible value for a kit of this quality and detail. Also, to help out, we’re offering a special limited time pricing of only $188.10. So, we just put the kits back in stock on our website and they’ve already started selling! Get yours at this special pricing while it lasts. Another update by ship modeler Clare Hess on building the Dana fishing boat from Billing Boats. The stern platform is a plywood piece that fits against the bulwarks behind the tiller. Being that this is a fishing boat and that this platform is to be covered with thin wooden slats, I presume that this was used for the process of bringing aboard fishing nets. The wooden slats would allow the fisherman to stand on the platform as water drains into the channels between the slats. The platform is a pre-cut piece of plywood, but attaching the platform is a bit problematic, as there are no grooves or anything that supports the platform. It’s supposed to be attached to the bulwarks by a simple glue joint. Ages of Sail is offering big discount pricing on Amati’s Hunter Q-Ship. Now $40 off the already low price of $139.99, making this high quality kit only $99.99. Order while supplies last! This is a wooden model of a typical Q-Ship used in WWI and WWII in an effort to lure German submarines to attack them. Ships like this were equipped with deck guns that were disguised or hidden, making the vessel look like a helpless merchantman. When a U-boat closed in, hungry for the kill, the Q-Ship would quickly reveal it’s armament and attack. This kit features a lot of etched brass parts and hidden armament under removable covers. A very unique model. You can buy the kit separately or as part of a combo set that includes tools, glue, and a book on ship modeling. 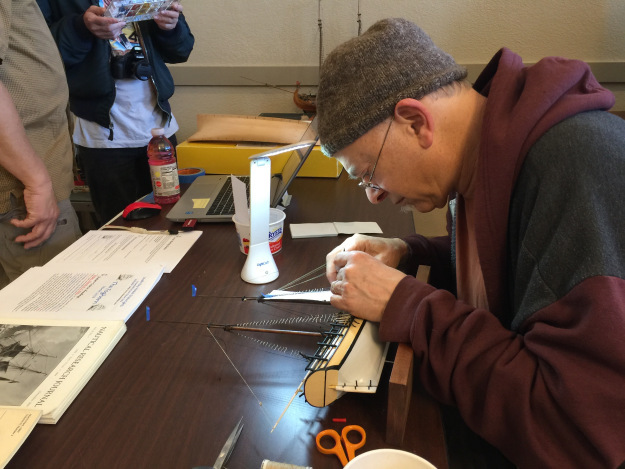 Check out these photos of a model built by a shipmodeler for Amati. Up to the challenge? Order yours and make sure to send us photos of your completed model! The Dana Build by Clare Hess continues. Now shaping the mast and preparing some of the details. At some point, we’re going to need to deal with one of the small details, namely the blocks. Billing Boats commonly includes pre-molded plastic block in many of their kits. I think they may use small wooden blocks for some things, but the blocks on this 1:60-scale kit come in plastic. Now, you may not like plastic blocks and may want to substitute some 3rd party fittings instead. The blocks in the kit are 3/16″ or 5mm single-sheave blocks. Amati makes 5mm single blocks in Walnut and you can find them at Ages of Sail here, at $2 for a pack of 20. Unfortunately, shipping far outweighs the cost of the blocks themselves. Not a problem if you’re already planning to order other things. But, personally, even though I have many choices of blocks on-hand, I just decided to try out the ones in the kit. We’ve actually had these for a while, but just realized they weren’t on our web shop. So, here they are now! These are the block sets for each of the 1/96-scale paper model ship kits produced by Model-Vessel for their Shipyard model kits and include both blocks and deadeyes. These are the same style of blocks included in their 1/72-scale Laser Cardboard kits, but made for 1/96-scale. As such, they need to be assembled. Each block is made up of 3 or more layers that need to be glued together. Blocks come in groups on laser-cut sheets – one layer per sheet. This makes alignment easy. After the sheets are glued together, the completed blocks can be cut free. The blocks are then easily cleaned up and painted. Note that we only sell the blocks in sets made specifically for each of the ship kits, we do not sell the blocks separately. Paper model building is a fun hobby that is relatively inexpensive, requires very little work space, and creates very little mess. Looking for an easy starter project? Maybe try a lighthouse kit?